NOAA/NASA reports that August was the warmest month on record because the oceans were the warmest ever. 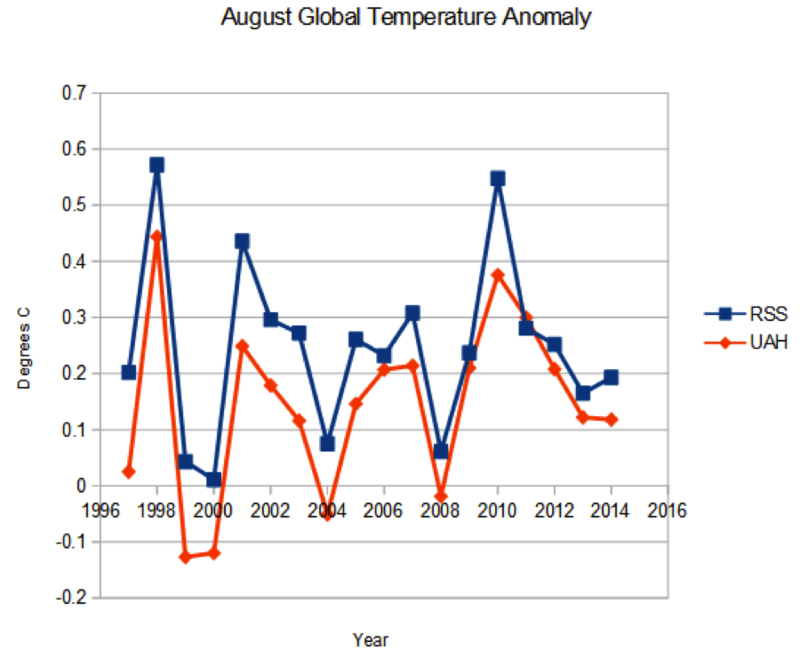 But contrary to the spectacular “hottest August ever” lies being propagated by NASA and NOAA -August was the coldest in five years and the second coldest in 10 years, according to far more accurate NASA satellites. NOAA and NASA climate agencies budgets depend on confirming government sponsored climate models . 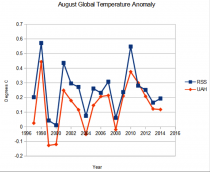 There has been no warming for 18 years as of September according to satellite. NASA satellite derived sea surface temperatures in the record back to 1978 show there were 73 months warmer with the warmest in May 1998 (nearly a full degree Fahrenheit warmer than this August). Like the surface land temperatures, ocean temperature warming is being intentionally exaggerated. Why the difference? Satellites provide an objective measure of the entire surface of the earth, land and sea. Surface data is severely contaminated by local urban and land use changes. Oceans, which cover 71% of the earth’s surface, have only been measured accurately with satellite since 1978 and later buoys since 2004. Dr. Helmut Landsberg, the Father of Climatology was one of my mentors on urban heat effects when I taught Microclimatology in college. I authored a peer review paper assessing the many problems with surface observations including urbanization. It addressed most all of the misinformation presented in the Letter to the Editor last Friday by our friend Bruce. In it, I link to a 2008 paper by Hadley’s Phil Jones et al., which found that contamination by urbanization in China was a very non-trivial 1C per century which but that did not cause the data centers to begin adjusting as that would have eliminated much of the politically proclaimed global warming. Because of the satellite data is ground truth, the focus on data manipulation as we showed you last post shifted to cooling off the first half of the 1900s. Since the media is largely friendly to the cause, you would not hear that this September will make it 18 years of no warming globally in the satellite data set and that the models are failing miserably. Record highs and lows tell the story that heat is not increasing. 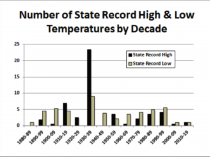 For 28 of the 50 state all-time record highs came in the 1930s and 38 before 1960 (Christy US Senate testimony). 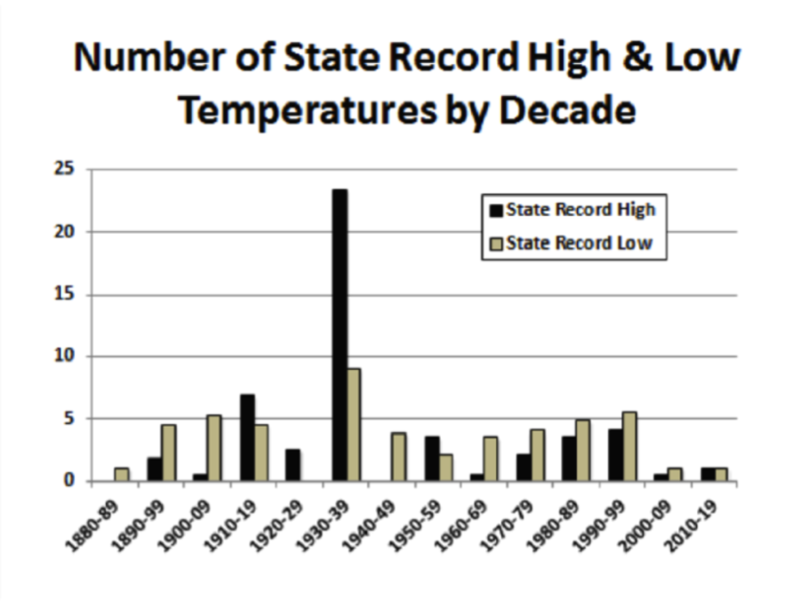 There has been more record lows than highs since the 1940s. The trend of 90 and 100 degree days have been down for over 75 years. NOAA reported no changes in flood or drought frequency since 1900. The last two years have had the fewest total of tornadoes on record and long term trend of strong tornadoes has been down. Global hurricane activity is at a 30 year plus low. We have gone 9 years without a major landfalling hurricane in the US, by far the longest on record. Sea level rise has declined to 4 inches/century from 7 inches in the 1900s. The last two years have had the lowest number and acreage of forest fires in the record back to 1984. Snows have increased not decreased. Arctic ice rebounded 43% since 2012 even as this was the year when the ice was supposed to have disappeared. We have a record number of polar bears. This month we blew away the all-time satellite record for Antarctic sea ice extent. All the climate models are failing miserably. The science argues the theory has failed, but politics and $165B keeps it alive. At the rally this weekend in NYC, 120 thousand enviro radicals, Hollywood and polical ignorati converged on NYC arriving in buses and planes and leaving behind a not very green mountain of trash. Ecologist Dr. Patrick Moore was a co-founder of Greenpeace when it focused on true humanitarian and animal cruelty causes. Back then we had real issues with air and water pollution. I was involved heavily with environmental causes and got my ABD on Atmospheric Chemistry. The movement made a sharp left turn in the 1980s. Patrick Moore told the Senate earlier this year and then made a powerful presentation you can see on HCTV explaining why he left Greenpeace when radicals and extremists with other agendas (population control, eliminating fossil fuels/nuclear, destroying capitalism, one world government) abandoned humanitarian efforts and railed against man as the enemy of the planet took control of Greenpeace and most all Environmental groups. Over time they adopted global warming as a tool. Patrick wrote about the new environmental radicalism. It is a powerful convergence of interests among a very large number of elites, including politicians who want to make it seem as though they’re saving the world, environmentalists who want to raise money and get control over very large issues like our entire energy policy, media, for sensationalism, Universities and professors for grants. You can’t hardly get a science grant these days without saying it has something to do with climate change. Steven E. Koonin, Undersecretary for Science during Obama’s first term, sees “climate science” as a tangle of arrogance, conjecture and dubious methods that cannot withstand the scrutiny of any reasonably sharp mind. 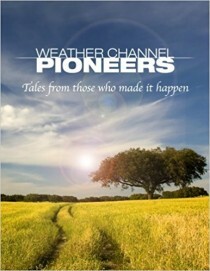 Next story will focus on the upcoming winter and why big government sources will again not get the forecast right.